Catfish is one of the most common of seafoods in the fish market of your local grocery store. Here is a tasty alternative to the often fried catfish. In a not-reactive container (glass or plastic), cool bath to 60 deg; then rinse and drop in the fillets. Immerse the fish and refrigerate for 30 minutes. Remove fish from the first brine, rinse thoroughly under running water, and place in second brine. Leave for 15 minutes for thin fillets and up to 2 hours for whole fish. Remove and rinse again and hang (using bamboo skewers) in a cool, dark place with good air circulation for about 3 hours. Using a fan will speed up the process. This drying allows a thin glossy sheen to cover the surface, which helps seal in the juices and prevents the oozing of protein to the surface. The surface should be completely dry to the touch. Place the fish on the grill or hand them from the skewers. start with a low temperature, just above 100 deg, for the first couple of hours. 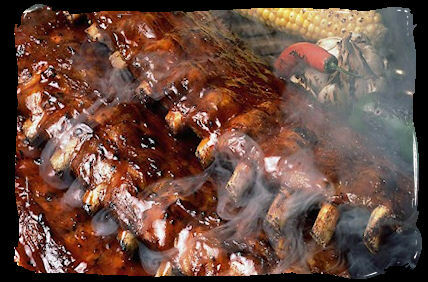 Thereafter, build up a heavy dense smoke and allow the temperature to rise to 160 deg. They shoudl be completely cooked in about four more hours or when their internal temperature reaches 140 deg.